One of the more difficult things to manage as you begin to scale and deploy containers at mass is trying to manage communications and access to your services. Not only is managing communications to your services difficult, but also doing it in a way that makes sense, is static and feels normal for your users. With an orchestration tool such as Mesos, your containers will most likely move from host to host quite often. This is exactly how it should be for environments running large amounts of containers. It shouldn't matter where your container lives and you should also not have to search for it as it moves around. Nor should you have to manage ports as your Infrastructure grows and your apps scale. I believe this to be one of the major pieces to consider when planning your container based environment. 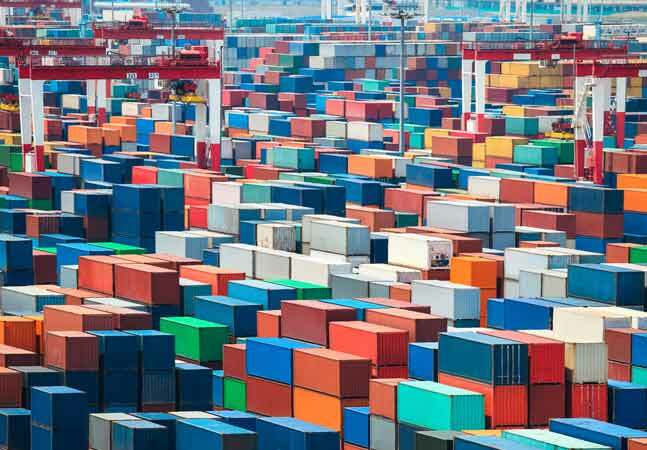 Think about the reason that you are considering using containers and then think about how you plan to orchestrate access to them and assume that your services will not be running in the same place tomorrow as they were today. We achieve this solution through a simple mechanism of Service Discovery and Load Balancing. In this post, Ill describe the tools that I have chosen to use in my docker based PaaS solution backed by Apache Mesos. I went with a solution that not only would suit the needs of our Mesos based services but would work along side any docker container that was deployed in the environment. Simply setup a node with load balancing and access to your service discovery and have the users route through this node to access their service. Demonstrations will be done using Marathon, Consul, consul-template + HaProxy, but as I said there are a ton of projects out there that can be used to help solve this issue. 2) Configure consul-template for HAProxy. It will reload the config each time there is a change with the service such as a scale up, down or a failure. Create new file /etc/consul-template/consul-haproxy.json which will be the configuration file to manage reloading haproxy anytime there is a change is service discovery. command = "systemctl reload haproxy"
Create the source and destination files for haproxy based on the config above. $SERVICE in the template file above is the service name that you will put as part of a ENV parameter in your Marathon json when you launch. It will register itself in Consul as that service name and anytime there is a change if will reflect the change to haproxy. 3) We can go ahead and start consul-template at this point. Run from command line or from systemd unit to make it permanent. 4) Registrator must be running on any host in the cluster that will need to have docker containers registered to consul and any host that is running as a consul agent. This watches the host on the docker socket and anytime there is a change, registers or deregisters from Consul. 6) After you launch the app and it starts on Marathon, check Consul to see if service is registered. 7) Now go back to consul-template server and check out the ha-proxy.cfg file. 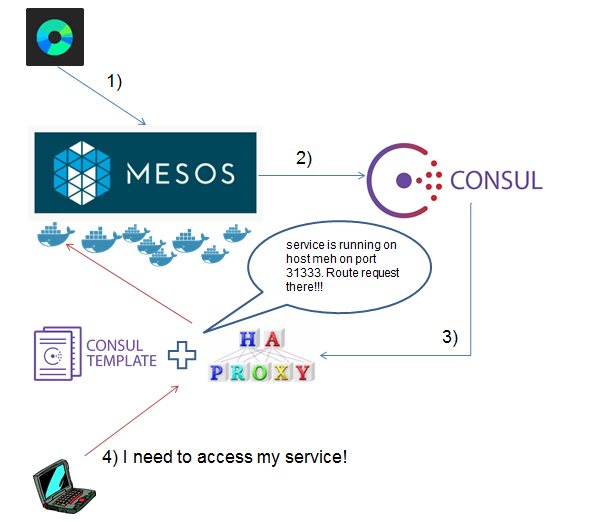 You service along with its port mappings on Mesos will be there as well. Hit the consul-template server at port 80 and you will be routed to your nginx app. 8) Scale the app in Marathon to 3 and watch consul-template automatically update your HAProxy config. Yellow is old, green is new. 9) Now kill one of the instances from Marathon, this simulates a failure scenario. Consul-template will update the change for the failed instance to the new! Yellow and green are the ones that have existed, blue is the new. Feel free to use your consul-template server for as many other services as you need. All you need to do is add additional service parameters in your template file as before with a different port. We are calling our consul-template servers "Edge Nodes" as they are actually outside of our Infrastructure and routing to the inside. These can live anywhere on your network as the only thing they need is access to read your Service Discovery. You should be able to dedicate very little resources to these machines as possible 1GB Mem 1 CPU. With the correct setup, you can also run these Edge Nodes in docker containers. You will just need to statically assigned IPs (Flannel, Weave, Calico, etc..) and port mappings for that container. 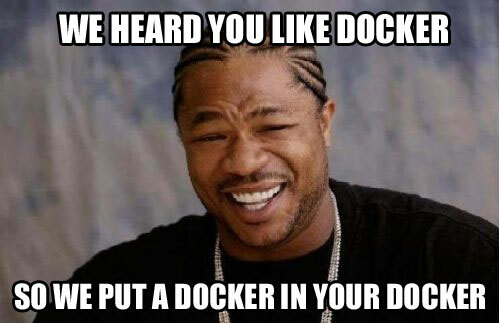 Running docker inside of docker. This is nothing new and in fact if you are using Docker universally to run virtually everything such as monitoring or service discovery, chances are you are most likely mounting the docker socket inside your container. I personally use docker in docker to build and push doing the same thing. This is where it gets hairy and you get into the inception aspect of this whole mess. The cool thing with running docker in docker is the fact that you are able to give yourself a nice little test bed with no worries of destroying ready containers and also utilize docker command line at the same time. Building and push new images etc. The only issue with this is the fact that you are mounting the docker socket within the container itself. You are exposing the hosts images and containers to the docker in docker. If you run a 'docker images' inside the docker container, you are seeing the hosts images. If you run a 'docker rm|rmi' you will wipe the host you are running on. There is NO isolation in this. Not only would you wipe the host but anyone else that is running docker in docker on the host would be doing the same thing. Image provide by yours truly... You're Welcome! Let us get this going. Ubuntu as the underlying host OS as I am starting to go back to my original Linux roots. Next: Create another LXC container and repeat the above steps and notice you get complete isolation and separate development environments with LXC. Add things into the LXC containers such as ssh and port forwarding on the host so you can SSH to it. 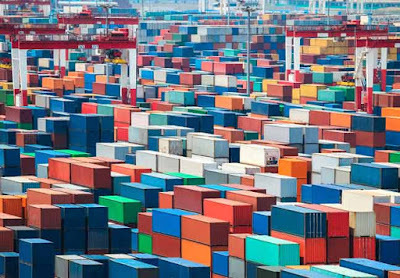 LXC is the original container runtime that got me interested in containers (my blog from a couple years ago). I will continue to use alongside docker for different things because I think that LXC has some functionality the docker doesn't do as well. For example, running OS containers, LXC is much better. 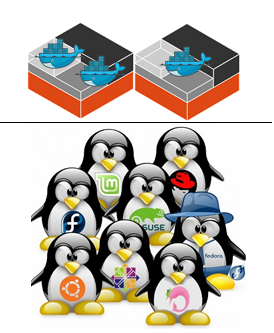 Docker still holds the belt for application containers in my opinion. Be sure to check out Rackspace's CaaS mentioned above. Awesome project and read. I will be following not only what they are doing but Openstack as well.